Perched high above the banks of the River Tiracol with stunning vistas over Querim Beach and out towards the Arabian Sea, Fort Tiracol Heritage Hotel is a truly unique property. The stunning views from the hotel’s panoramic restaurant, serving up delicious Goan-Portuguese cuisine. Adding to the Fort’s character, there is an active church within the old walls. It becomes a buzz of activity on Sundays when the villagers come in their best dress ready for the morning service. 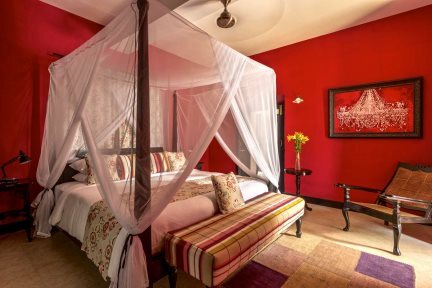 A hotel presenting a comprehensive touch of authenticity in the most impressive of locations, Fort Tiracol Heritage Hotel provides a fascinating window into Goa’s colonial past; but that’s not all you’ll get from a stay at this one-of-a-kind hotel. Originally built in the early 17th century by the Maharaja of Sawantwadi, Khem Sawant Bhinsle, the fort was invaded by the Portuguese in 1764 and became an important military bastion for the Portuguese colony. Today, this fortress has been beautifully converted into a heritage hotel, where guests can stay within the historic walls and ponder its turbulent history, as well as enjoy plenty of comfort, relaxation and indulgence. With just seven uniquely decorated guest rooms, this hotel offers an intimate experience, and due to its stunning elevated position, the restaurant offers not only fantastic cuisine, but also incredible views to soak up as you dine. Great facilities can be enjoyed in the authentic and attractive rooms, equipped with everything from queen-sized beds and air-conditioning, to a safe and bathrooms boasting rain showers. This property is a great choice for those wishing to discover the state’s rich colonial past as part of a multi-centre holiday, combining a stay here with one of our other heritage hotels. Please note, this hotel is not suitable for children under the age of 12 or those with walking difficulties. Why not combine a stay at Fort Tiracol Heritage Hotel with time in another of our unique heritage hotels? Contact our reservations team to tailor-make the perfect itinerary for you. "Perhaps the most enchanted spot I visited during my time in Goa was Fort Tiracol, a tiny outpost on the northern jaw of the Tiracol river that separates Goa and Maharashtra." The Deluxe Rooms include a double bed and a bathroom with rain shower. Each room is unique in style and décor.